Specially designed to be installed on doors of industrial cold stores and freezers with big temperature differences. • Reduces mist, snow and ice, decreasing risk of accidents. different temperatures and different speeds. • High efficiency barrier against big amount of thermal losses due to a big temperature difference (shorter payback). • A lateral enclosure structure is required to cover 100% of the opening up to 3 jets, not included. standard. Other colours or stainless steel are available on request. 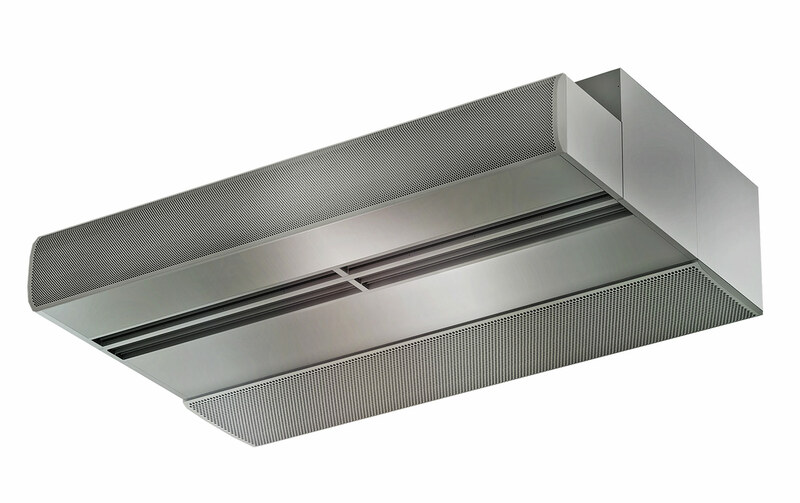 • Large perforated inlet grille avoiding intensive maintenance. • Anodized aluminium outlet vanes, airfoil shaped, adjustable from 0 to 15º each side. provided with 5-speed selection, very low noise level. • Includes electrical shielded element of 3 power stages with integrated regulation. • Triojet is automatically fully controlled by Clever control. Electronics and controller protected inside IP65 boxes. Plug & Play connections. • Ready for BMS connection via Modbus RTU.